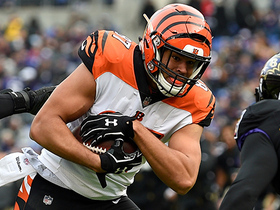 Dalton (thumb) has been tossing a football for the past two weeks and recently began shooting a basketball, Geoff Hobson of the Bengals' official website reports. 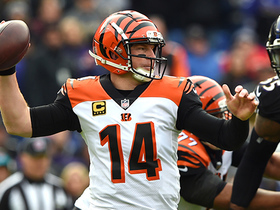 Bengals director of player personnel Duke Tobin suggested Dalton (thumb) will enter 2019 as the team's starting quarterback, Fletcher Page of The Cincinnati Enquirer reports. "We're very comfortable with Andy," Tobin said. "We think he's got a number of years left. We feel like we can win with him. But with any position group, we don't just throw away the whole draft board at a group just because we're satisfied with who we have." Dalton underwent surgery Tuesday to repair a torn ligament in his right thumb and said he expects to be ready to go for the Bengals' offseason program, Paul Dehner Jr. of The Cincinnati Enquirer reports. 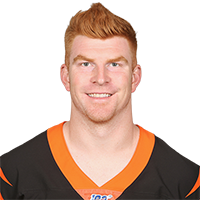 Coach Marvin Lewis relayed Monday that the Bengals' medical staff expects Dalton to fully recover from his thumb injury in advance of the 2019 season, Paul Dehner Jr. of The Cincinnati Enquirer reports. Dalton (thumb) was placed on injured reserve Monday. 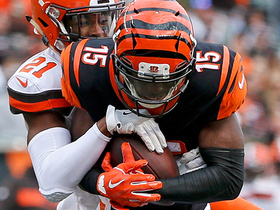 Coach Marvin Lewis said Monday that Dalton still needs more tests to determine the severity of the thumb injury he suffered in Sunday's 35-20 loss to the Browns, Marisa Contipelli of the Bengals' official site reports. Dalton is slated to undergo further testing on his right thumb, Katherine Terrell of ESPN.com reports. 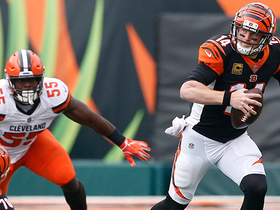 Analysis: Following Sunday's 35-20 loss to the Browns, coach Marvin Lewis indicated that the initial belief is that Dalton's thumb injury is not serious. That said, it's still too early to know if the QB's status for next weekend's game against the Broncos is in any danger. 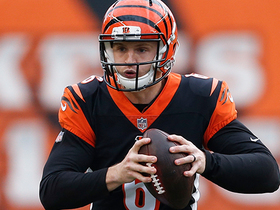 If Dalton is forced to miss any time, Jeff Driskel would be in line to handle the Bengals' first-team QB reps.
Dalton has been ruled out for the remainder of Sunday's game against the Browns with a right thumb injury. Analysis: Jeff Driskel will finish up Sunday's game in relief of Dalton, who completed 10 of 17 passes for 100 yards, to go along with a TD and a pick as well as two carries for 21 yards. 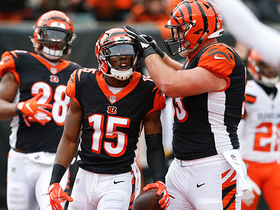 If Dalton's injury threatens his Week 13 availability, the Bengals could add QB depth via the free agent route or they could promote Connor Cook from the team's practice squad. 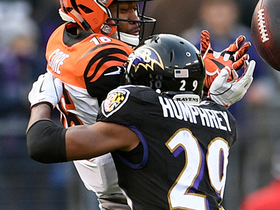 Dalton injured his right thumb trying to recover a fumble on a bad snap in the third quarter Sunday against the Browns. Analysis: Dalton immediately went to the locker room to get the thumb examined after the play, which resulted in a turnover and subsequent Browns touchdown. Jeff Driskell is in line to replace him should he miss time. 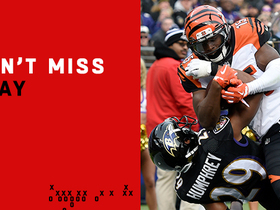 Dalton completed 19 of 36 passes for 211 yards and two touchdowns during Sunday's 24-21 loss to Baltimore. He added a team-leading 29 yards on two carries. Dalton completed 12 of 20 passes for 153 yards, one touchdown and two interceptions during Sunday's 51-14 loss to the Saints. He added an eight-yard run during the contest. 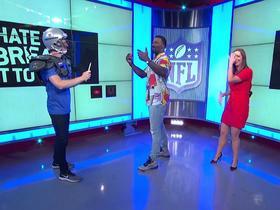 NFL Network's James Jones perfectly predicts a four-touchdown night for Cincinnati Bengals quarterback Andy Dalton. 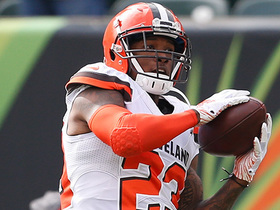 Cleveland Browns defensive back Damarious Randall intercepts Cincinnati Bengals quarterback Andy Dalton.